Pixar Fest, the biggest Pixar celebration ever to come to Disney Parks, brings guests together to celebrate friendship and beyond from April 13 through Sept. 3, 2018, at the Disneyland Resort. This first-ever Pixar Fest presents some of the beloved stories from Pixar Animation Studios in new ways at both Disneyland and Disney California Adventure Parks, with characters and experiences from films such as Disney•Pixar’s “Toy Story,” “Monsters, Inc.,” “Finding Nemo” and “Up.” Guests will join the fun as they experience a new nighttime spectacular, the return of two favorite parades with fresh new Pixar surprises, new décor, atmosphere entertainment, creatively themed food and beverage and exclusive event merchandise. 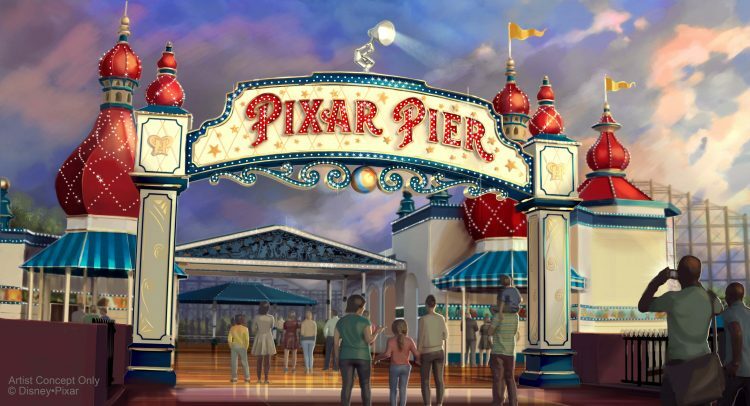 A new fireworks show, “Together Forever – A Pixar Nighttime Spectacular,” will celebrate Pixar stories through the decades as it lights up the sky over Disneyland, connecting guests with characters they’ve come to know and love. Along with dazzling pyrotechnics and memorable music, a heartwarming story celebrates the theme of friendship, an ever-present concept in Pixar animation. “Together Forever – A Pixar Nighttime Spectacular” invites guests to embark on an emotional journey that begins with the meeting of unlikely Pixar pals and follows their adventures as they overcome obstacles and forge everlasting friendships. “Together Forever” comes to life through projections on iconic park locations: Sleeping Beauty Castle, the water screens of the Rivers of America, the façade of “it’s a small world” and the buildings of Main Street, U.S.A. The grand tradition of Tinker Bell flying over Sleeping Beauty Castle also gets a Pixar twist, with a special flyover by none other than Buzz Lightyear. For the first time, “Pixar Play Parade” will make its way through Disneyland Park this spring, and it’s being led by someone new. The parade will begin just as all Pixar films have, with an appearance by the iconic and adorable Pixar Lamp. Rolling ahead of the famous lamp will be the familiar yellow Pixar Ball. Also joining the parade are characters from the beloved film, “Up.” Wilderness Explorer Russell will appear astride the colorful flightless bird, Kevin. Carl Fredricksen and Dug follow behind, amid green foliage and snipe chicks, with Carl’s tethered house floating above. “Inside Out” also joins the “Pixar Play Parade,” with Joy and Sadness perched atop colorful memory orbs as they take flight aboard Bing Bong’s rocket wagon, with Bing Bong himself cheering them on. Also on April 13, “Paint the Night” parade returns, and this time guests will enjoy the parade’s 1.5 million, brilliant LED lights and catchy tunes at Disney California Adventure. “Paint the Night” features pals from Disney•Pixar’s “Toy Story,” “Monsters, Inc.” and “Cars.” And another beloved Pixar story will join “Paint the Night” in June; a new, high-energy float inspired by “The Incredibles” will add to the fun. Mr. Incredible, Mrs. Incredible and Frozone will showcase their superhero awesomeness as they take on their newest threat, the Underminer. Violet, Dash and Jack-Jack also showcase their unique powers in surprising new ways, as shown through dynamic and innovative visual technology. Like the other elements in this spectacular parade, this new float will come to life through a series of dazzling LED lights, new music elements and high-tech, pop-art effects inspired by the mid-century-modern style of the films. DJ’s Dance ‘n Drive: Interactive dance party in Cars Land gets guests moving to the music.